Performance Time: Approximately 30-45 minutes, 24 pgs. CHILDREN’S MUSICAL. In search of a new home, Lenora the ladybug comes across a beautiful garden. But Bennie, the bean plant, and Special, the rose, tell poor Lenora to bug off and go live in a nearby English garden. Rejected, Lenora ventures off to find a new home. But in the meantime, some rascally aphids invade the garden and begin chewing up all the plants. 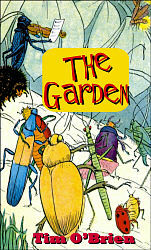 Can Bennie and Special, with the help of the other garden insects, convince Lenora to come back and scare away the aphids before the garden is destroyed? Not only does this play have an important message about accepting others, but it is a fun way for children to learn about photosynthesis and ecology. Tim O’Brien has taught science and music for more than 15 years. In 2000, Mr. O’Brien won a Visions Canada award for his song, "Millie the Millennium Bug.” A graduate of Niagara University, Mr. O’Brien and his wife, Catherine, live in Burlington, Ontario.